Welcome to the Time Tarts website. Time Tarts are a small but active business based in Sherwood Forest, North Nottinghamshire. We have worked to build a reputation for excellence and being able to supply the impossible to find prop. We are a very busy company working on more than 100 different TV programmes in the last seven years. 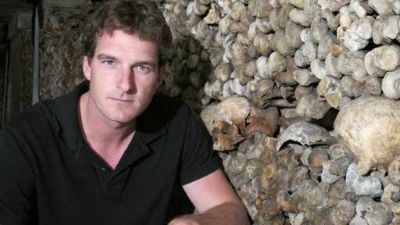 Dan Snow's "Filthy Cities" showing on BBC 2 shortly. A welcome return to working with October Films on "Warriors' Graveyard" for Channel 4 and Discovery. BBC, Granada ITV, Flashback, Green Bay, Atlantic Productions, Fulcrum TV, Lime Pictures, Oxford Scientific Films, Spire, October Films, 3DD, Videotext, ABC, Southern Star, Wide-eyed Entertainment and Graham English & Co. Plus many others. Other recent work includes "The Blitz Witch" and two other "Mystery Files" for Flashback TV/Channel 4 and "Roman Rule in Britain" for Green Bay in Cardiff. We also worked on Oxford Scientific Films' new series "Science and Islam" and have recently filmed with the BBC on a documentary about the Life of Ghandi. Our mission - to recreate history accurately but with an understanding of the demands of modern media. We hold large stocks of costumes and props for an extensive range of time periods. Previous projects have included Neolithic, Ancient Greece, Egypt, China and the Aztecs, The Iron Age, Romans, Saxons, Vikings, Medieval, The Crusades, Tudor, The 17th Century and English Civil War, 18th Century, Regency, Victorian, World War One, The 30s, World War 2, the 1950s and even the Vietnam War. We have experienced, specialised staff for location services and have our own in-house production facilities supplying some of the best and most accurate costumes and props available. We have earned a reputation for being able to supply esoteric items that others cannot. Where else might you find a South American Tumi sacrificial knife, a chinese repeating crossbow or a 1706 Mantua Gown? Please don't hestitate to get in touch. We are used to working to the demands of the modern media. In fact our tongue in cheek catch phrase is "We do the difficult immediately, the impossible takes a little time". Whatever your budget we aim to be able to help so whether you want a single key prop or a complete design to shoot solution of costumes, props, armoury and even location services give us a call.